Courageous Christians United - Blog - Can the Various First Vision Accounts of Joseph Smith be Reconciled? Is Catholicism a False Gospel Like Mormonism? Repealing “Don’t Ask Don’t Tell”? What is the More Important Issue in This Campaign? Did Charles Schulz Really Love His Daughter? Christian "Bigots" vs. Christian "Bigots"
Is Tom Cruise the Second Coming of Christ? Should a Christian Vote for Mitt Romney? I am not at all convinced about where I stand in answering this question concerning the various accounts of Smith’s first vision, so I would appreciate any insight in the comments below. However, after looking over the various accounts that others have identified as referring to the first vision of Joseph Smith, I hold that the accounts can be reconciled. Nonetheless, I am convinced that these different accounts seem rather fishy and messy! The first known account from Smith comes in 1832--12 years after the supposed event central to the foundation of the LDS Church. Some critics charge that Smith could not have witnessed the account with all the different versions he gave. Yet just because there are different versions which really cannot be reconciled doesn’t entail that one could not have witnessed an event. At best, all that may be proven from this is that one’s testimony of what actually happened cannot be reliable for others to believe. Professor Charles Anthon certainly was a witness to what happened between him and what most people think was Martin Harris, for example. However, the former gave two contradictory versions of the account. For example, the first account claims he declined giving Harris a written account whereas the second account, 7 years later, Anton claims he gave Harris (if that was really him) a written account “without hesitation” (both Anthon letters may be viewed in Jerome J. Knuijt’s, The “Anthon Affair”). Remembering particular events even hours from when they happened is not always very easy. Think of how much trouble most of us have remembering the name of person we just met! Nonetheless, no one questions that a meeting took place between Anthon and someone wanting verification of the Book of Mormon. The reason for this is that we have more than Anthon’s side of the story here. We have another witness, viz., Harris. Thus, believability also goes up with other witnesses who can be cross-examined and remain consistent in what they affirm. Keep in mind that Christians who hold to the inerrancy of the Gospel accounts think that the apparent contradictions can be cross-examined and reconciled to where there is no need to hold that they are genuine contradictions at all. So, for example, there is no genuine contradiction between one account from one author testifying there was only one angel appearing at the resurrection of Christ and another account from another author who testifies there was more than one angel there. Both perspectives can certainly be true, since no exclusive language is used that would rule out the other account at a particular time… if in fact a particular time is used for both accounts. However, for the alleged first vision story and all these other subsequent visions up until Smith and Cowdery established their church, all we have is the accounting of Joseph Smith. If he gives different versions of this story and they cannot be reconciled, then we have no good reason to believe him. Of course, it’s possible that God gave him some sort of vision, yet since we’re all human and make mistakes, perhaps Smith made a mistake in recounting certain details of that supposed event, especially given how much further from the event he was. But even if he had the same consistent story from close to the time the supposed event happened, this alone provides no good reason to buy his story. Believability goes up if I actually know something of the person giving the account. My wife, for example, should be believed until I have reason to doubt a particular story. Now I do know something of Smith’s character, and let’s just say I’m not impressed. I’d also suppose that Harris bears the burden of proof in claiming that Anthon initially approved his manuscript. Why? Because of the fact that the former was invested in the latter’s credibility from the start. Anthon was a distinguish professor. Harris was a simple farmer. Of course both can misrepresent the story, but knowing nothing else, my money is on Anthon just like Harris’ was. So let’s look at the individual accounts and see if there are in fact legitimate contradictions in the accounts or see if Smith was simply adding or ignoring details in subsequent accounts. For our purposes, I will focus on the accounts that Smith had control over while he was alive. I won’t bother with other people’s accounts of what they remembered Smith supposedly said to them. In this first known account written by Smith, he claims he was 15 (in 1821) when the Lord Jesus appeared to him in a pillar of fire light in the wilderness and forgave his sins. The Lord confirmed His existence and that the great apostasy was true, even though Smith had already learned these things sometime before from searching the scriptures from ages 12-15. Smith said an angel showed up to tell him about Smith’s sins being forgiven and about the gold plates. He said this happened when he was 17 on September 22, 1822. Again, just because one person was mentioned here who appeared to Smith doesn’t entail another person or persons were not there as well. If this age 15 in 1821 claim is to be believed, we don’t know if there were others who appeared to Smith as well. So contrary to what most think, given this 1832 account, it must be understood that Smith had another visitation of at least Jesus a year after the well-known and official first vision story of 1838. Why, if he knew about apostasy from reading scripture sometime between age 12-15, did he ask the Lord which church to join as in the other versions? A possible answer may be that Smith was just reconfirming the knowledge he had already gotten from studying the scriptures and with the vision we learn later that he supposedly got at 14 years of age--a year before. However, it does seem hard to believe that this problem wouldn’t have been remembered being answered just a year before when he supposedly had the first vision. Yet it just may be that the first vision wasn't good enough, since Smith was thick-headed and kept doubting. Keep in mind that John the Baptist doubted Jesus when the former was in prison, or how about Gideon testing the Lord twice after His angel appears to him? Perhaps the biggest problem I find with this account is that Smith clearly botched himself being 17 in September 1822. He was born December 23, 1805. So in September 1822, he would have only been 16! So should we take age 17 or September 1822? There is no way we can’t take both. But is this really that big of a deal? I'm sure we can make the same mistake thinking back to an event in our lives during our teen years. That doesn't invalidate the event itself. Cowdery, under the authority of Smith, says in one edition of the Messenger and Advocate (1834) that Smith was age 14 when religious revival happened, and then later in the next edition (1835) corrects himself to say it was when Smith was 16 (“in the 17th [year]). Smith continued to seek the Lord for a confirmation of God's existence and that his sins were forgiven. Then an angel shows up on Sept. 21, 1823 to give that confirmation and forgiveness. They still can’t get the exact year of his age right! This is laughable! Smith would have been 17, not 16, on Sept. 21, 1823. This would seem to indicate an addendum to the account of 1832, which doesn’t mention religious revival or excitement. Does this indicate that we are supposed to believe that there was no religious revival when Smith was 14? Not necessarily. It seems Cowdery is simply trying to tie this religious revival and excitement in with what happened when the angel appeared to Smith when he was 17 or 16. The story is supposed to be about this angelic appearance, not what happened to Smith at age 14. In this account to a Jewish minister, Smith clearly states that two persons appear, and then the account clearly says many angels appeared. This was about 14 years of age, which was the first time Smith prayed. Three years later, the account says that he "saw another vision of angels." The account is vague concerning the “first time” he prayed. Does it mean that Smith never prayed in his life up until this point or does it mean that this was the first time he prayed concerning the matter of the different religions? Neither option looks good. The latter option probably makes more sense, but it still seems strange that it took Smith two years from the time he began his search of religion (according to the 1832 account) to finally pray for the first time. Perhaps the emphasis is what immediately follows, viz., the identity of the “silent grove” as the place that Smith prayed concerning this perpetual problem of different religions. Further, the account is ambiguous who the two persons were. Were they the Father and Son or were these two persons part of the many angels? His reference to “another vision of angels” in 1823 need not be excluding the possibility that the two persons were the Father and Son. 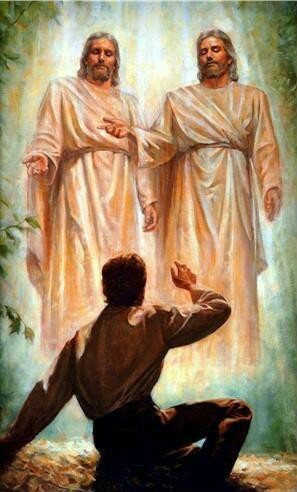 Smith could have simply been drawing reference that both visions had angels in them, but again, it's unclear whether one of those visions contained the Father and Son. One would think that if the Father and Son were really the two persons, they would be clearly stated as such. However, perhaps Smith had personal reasons for not going full throttle and instead attempted to be somewhat vague to a Jewish minister. Perhaps Smith thought simply talking clearly about angels and not being clear about seeing the Father and Son would prove more palatable for this Jewish minister. As before, there was no specific mention of the Father and Son. The brief summary account of what was told to Erastus Holmes simply mentions the first visitation of angels when Smith was about 14. As such it parallels the account given several days earlier. This November 14th account was later emended in the History of the Church to read simply "the first vision." Again, it's possible that at this point Smith simply wanted to leave out a definite reference to the Father and Son for whatever reason. Again, the passage never said the "only" appearance was of angels, so there is still some wiggle room if looking at simply these accounts by themselves. However, put into a broader picture of Mormonism, it's more understandable what's really going on here. That is, the first vision not only had angels, but also had none other than the Father and Son appearing to Smith. This has become known as the official version, which is printed in the LDS own scripture—Pearl of Great Price. In this account, Smith was 14 years old, and there was a “time of great excitement” concerning religious proselytizing. He had never thought before that all churches were wrong when he asked which of all the sects were right (1:18). Now the Father and Son are mentioned, and both speak to Smith. Three years later in September 21, 1823, an angel appears to tell Smith about the plates. How is it that here, at age 14, "it never entered into my mind that they were all wrong" and yet the 1832 account says from 12 through 15 years of age, Smith searched the scriptures and concluded there was a great apostasy and then he called to the Lord for mercy in the wilderness and the Lord appeared to him when he was 15? At this time when he was 15, the Lord Jesus appeared again and told Smith that no one was good; that they draw near to the Lord with their lips, but their hearts are far from Him. There is still no tight contradiction here. 1832 simply says Smith began at 12 to study the scriptures concerning the abominations of men. There is nothing at this point about thinking that all their churches were wrong. So at what point between 12 to 15 did he arrive at the conclusion that they were "all wrong"? According to 1832, there's nothing that precludes it from being when he got his first vision in 1820 at age 14 as the 1838 version states. So Jesus was the one who originally gave that knowledge then to Smith. Then he subsequently received that knowledge from the scriptures sometime between 14-15, and then the Lord confirmed that to him again when He showed up a year later at age 15. So the 1832 account should technically not be taken as a first vision account. It’s a subsequent vision account. Why did the 1832 account never mention Smith’s first vision? Who knows? Again, perhaps Smith wasn’t comfortable divulging all the other details of the 1838 account in 1832. Perhaps God told Smith not to mention it then to test our faith regarding the latter’s veracity. Regardless, if one takes Smith’s words literally in 1832 about being 15 when this visionary event happened, then there is no legitimate contradiction here. Smith doesn't mention the Father and Son by name. Instead, two unidentified persons appeared to Smith. Three years later, an angel is mentioned showing up. Again, same as before. Just because the persons aren't identified as Father and Son doesn't entail that they weren't the Father and the Son. Just because one angel is mention three years later doesn't entail that other angels weren't around. Just because a revival wasn't mentioned doesn't invalidate Smith's other versions where he claimed there was a revival. Perhaps I’m missing something, but I don't find these accounts to be clear contradictions that can't be worked out. The problem is that I know Smith was a false prophet, and so with that as background knowledge, it seems more likely to me that Smith was growing his visionary stories just like his own theology. Now just because these visionary stories may turn out to be consistent (i.e., non-contradictory) after a lot of work does not entail that they are consistent with what we know regarding other historical facts. For example, we know that God wouldn’t contradict Himself and claim that the Church Jesus founded would somehow be in need of restoration through Smith when Jesus already promised the gates of hell wouldn’t prevail against it (Mat. 18:16). There is also a huge problem with when the Palmyra area revival took place. All the historical evidence offered by Marquardt and Walters in Inventing Mormonism, including Smith’s own dating based on his family’s moves to Palmyra and to Manchester, as well as Smith’s mother’s statement concerning the circumstances subsequent to her son Alvin’s death in 1823, as well as church records and publications, point to an 1824-1825 revival. There is only Smith’s word on an 1820 revival. There is no external evidence for it or an 1823 date for a later corrected edition of the 1835 Messenger and Advocate. The evidence clearly shows that Smith could not keep his story straight. And if 1824 is the supposed date of Smith’s first vision, then the whole story falls apart. He wouldn’t be a 14-year-old boy in 1824 when the Father and Son supposedly showed up for the first time to him (contrast Joseph Smith History 1:7). It wouldn’t be three years later in 1827 when the angel showed up to initially tell him about the gold plates (contrast History 1:27). It wouldn’t be four years later in 1831 when he was able to receive the plates so he could begin the process of translating them (contrast History 1:59), and it wouldn’t take him three more years before he could publish the Book of Mormon in 1834. Why? Because the Book of Mormon was in fact published in 1830. In short, given an 1824 date for the first vision, there just isn’t enough time for all the events listed between it and the publication of the Book of Mormon.